We use 100% pure sustainably harvested wild Alaska chaga mushrooms and 100% organic alcohol to make our dual-extracted tincture. 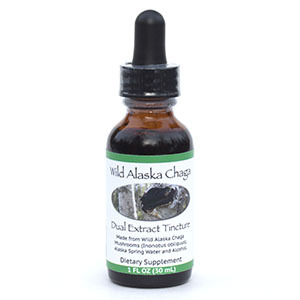 Double extraction is performed in Fairbanks, Alaska to capture maximum levels of chaga’s beneficial water and alcohol-soluble constituents. Each bottle is sealed for your safety while maintaining maximum freshness and potency. Scientific studies suggest that certain beneficial molecules in chaga are only activated (soluble) in alcohol and will not be present in a hot water extraction. For individuals interested in harnessing chaga’s potential health enhancing properties, betulinic acid may be the most important chaga constituent to consume. The alcohol portion of the tincture activates betulinic acid while the hot water extraction does not.